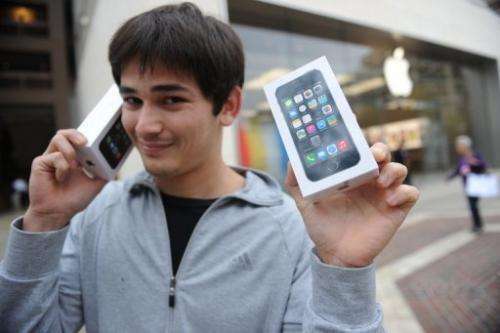 A man poses with his two new Apple iPhone 5S in Glendale, California, September 20, 2013. Apple said it sold a record nine million iPhones in the three days after launching two new versions of the smartphone. "This is our best iPhone launch yet—more than nine million new iPhones sold—new record for first weekend sales," said Apple chief executive Tim Cook in a statement. The figures from Apple appeared to defy predictions from its critics that the company is losing momentum in the smartphone market and in innovation. "Apple gets the last laugh," said Roger Kay, analyst at Endpoint Technologies Associates, in a tweet. Apple said demand has exceeded the supply for the new handsets, and that some customers will have to wait. "The demand for the new iPhones has been incredible, and while we've sold out of our initial supply of iPhone 5s, stores continue to receive new iPhone shipments regularly," Cook said. "We appreciate everyone's patience and are working hard to build enough new iPhones for everyone." Apple began worldwide sales Friday of the high-end iPhone 5S and a lower-cost iPhone 5C, drawing crowds from Australia to Tokyo to Paris to New York. The new phones are being sold in the United States, Britain, Australia, Canada, China, France, Germany, Hong Kong, Japan, Puerto Rico and Singapore. Apple also said more than 200 million of its smartphones and tablets are now running the redesigned operating system iOS 7, "making it the fastest software upgrade in history." The new operating system has a bolder look, and includes the free iTunes Radio launched by Apple. It is a free upgrade for a number of iPhones and iPads sold in the past couple of years. Apple said in a filing with the Securities and Exchange Commission that with the strong response to the new iPhones, it now expects revenue for the fourth fiscal quarter to be near the high end of its range of $34 billion to $37 billion, and that profit margins will also be near the high end of its estimate of 36 to 37 percent. Apple shares, which have been under pressure in recent months, shot up 4.97 percent to close at $490.64. The news from Apple "implies a message from management that the company is back on track," said Ben Reitzes at Barclays. Telecom analyst Jeff Kagan called the sales "stellar" but said Apple may have boosted the numbers by not allowing pre-orders for the iPhone 5S. "Traditionally users could pre-order devices. Not this year," Kagan said. "This year anyone who wanted a new iPhone, must get into line. That bolstered the lines and strengthened opening weekend from a PR perspective. This upset users, but made for great numbers." Apple faced criticism for not cutting the price of its iPhone 5C as much as some had expected to appeal to emerging markets and budget-conscious buyers. The lower-cost iPhone sold for $99 in the United States with a carrier subsidy, but $549 without that, and more in other countries. Walter Piecyk at BTIG Research praised Apple for "an incredible manufacturing feat" in getting so many devices to market and said he expects the company to sell 34 million iPhones in the fourth fiscal quarter. All of this gives Apple strong momentum, Piecyk said: "The positive impact on Apple's impact from the press around the product launch, record sales and recovering stock price cannot be underestimated." A survey by the research firm Localytics said the more expensive iPhone 5S was outselling the 5C in the US market by a margin of more than three to one, and by a five-to-one margin in Japan. "This makes sense, since those who feel the need to buy a new device the very weekend it launches are most likely the power users who want the highest-end phone experience," said Localytics analyst Bernd Leger. "It's not altogether clear whether poorer countries are buying more 5c's compared to 5s's, but it will be good to keep a close eye on this data in the next few days to see if there is any pattern emerging." The news came the same day BlackBerry, which just a few years ago was near the top of the smartphone market, said it had reached a deal to sell the company for $4.7 billion, after weak sales of its new handsets which led to losses of nearly $1 billion.